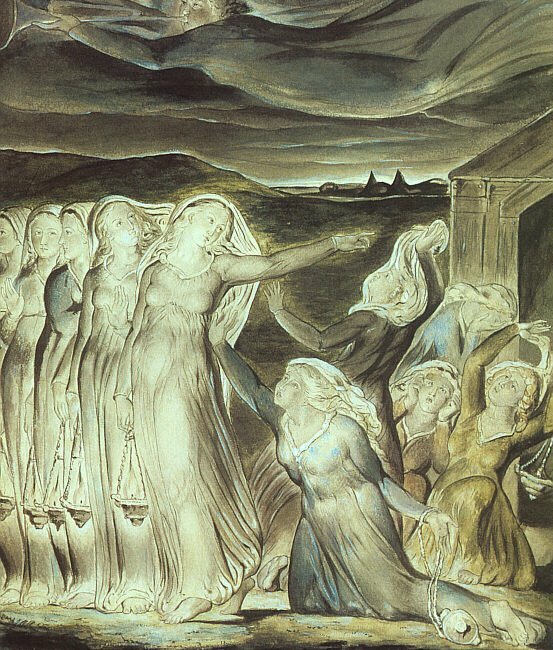 This painting is by the English artist and poet, William Blake. It depicts the Lord’s Parable of the 5 wise and the 5 foolish virgins. This parable is the basis of Philip Nicolai’s hymn, Wake, Awake for Night is Flying. Reflection: These pastors and hymn writers, with their congregations and families, suffered plague, war and sickness. What sustained these men through such turmoil, when the ground beneath them was shaking and then write some of the greatest hymns for the Church’s song? They may have seen plague, war and sickness as God’s judgment and the Word of God makes us stop at His judgment so that we hear His grace in Christ who suffered our plagues, wars and sickness. We have expectations of life being easy but not so long ago, man did not have such an expectation. Expectation, though, is not hope. Such calamities remind us we can not fix the world so we can look again, not to our selves, but to where true joy is found: The rock of salvation, Jesus Christ. Faith can only have something or someone to seize for salvation and this is the justification of the sinner by Christ’s Atonement, the Savior, once and for all from the Cross, preached and taught into our ears and hearts, by sermons, yes! But also by hymnody. In the Service Book and Hymnal (1958), the former worship book of the ELCA’s predecessor Lutheran denominations, the forward states that they wanted the hymns to be more “devotional” and have a less of a “didactic” content. Nowadays, the search for the mere “devotional” devolves into a music that makes me feel a certain way. The didactic or teaching content of Lutheran hymnody is so important because it is the objective Word of God written in Scripture sung in words and music so we can learn and learn to praise aright in heartfelt devotion. Consider “Wake, Awake, for Night is Flying”: this hymn is the Parable of the Foolish and Wise Virgins (Matthew 25: 1-13) set to music. It is usually sung in Advent, pointing to the time on earth when the Bridegroom arrived and the time to come when those who are eager for His appearing, He will come again. It is didactic and instructional. Dispensationalist and millenialist false doctrine is shown for what it is in that magnificent hymn of Scripture by the true and correct doctrine of our Lord’s parousia, in Scripture, correctly taught. He comes not when we expect it as chiliast timetables lay out and get wrong. He comes at the fulfilled time for those who long for His appearing (cf. 2 Timothy 4:8). At Concordia Junior College, I took a one credit course on hymnody. Professor “Ollie” Rupprecht pointed out that J.S. Bach had some 80 volumes in his library (quite an expensive acquisition in that day) and 60 volumes were on Lutheran Doctrine. This doctrine has been derided as too “sterile”. It is not. Like Jack Webb in Dragnet said: “The facts, ma’am, just the facts.” The objective justification by the life, word and work of Jesus Christ is the reason to sing in the midst of the world when the “nations rage” and “kingdoms totter” (Ps. 46: 6). Sing hymns of praise and joy to Thee. 1. When He washed His disciples feet He said, A new commandment that you love one another, as I have loved you. It is written in Leviticus that we are to love our neighbors as ourselves, so what is new in the new commandment is, “…as I have loved you”. In that way we love each other and show forth His love to all. 2. When He broke the bread and gave the Cup, He gave us His body and blood with the words, “Do this”. The Holy Communion is not optional, but a command. In Jewish tradition the 2 candles on the dining table represent: Command and Remembrance. Yes! “Do this, in remembrance of Me.”As we are serve one another the Lord serves us His Body and Blood till He comes again in glory. His Church is called to serve the Dinner: the Holy Communion, the Lord’s Supper, the Mass. We only can love as He first loved us and this is by the Holy Communion with His Body and Blood. A blessed Triuudum! 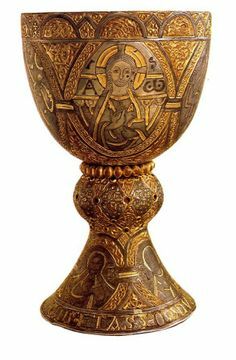 The apostle [Paul] wishes to say: Consider, beloved Christians, that when you receive the blessed cup and the blessed bread, each one partakes of the body and blood of Christ; they are both common to all of you. You come into body-and-blood fellowship with one another. For just as many grains become one bread, so in the Holy Supper, you, though you are many, become one Body, one mass, because you are partakers of the one bread and with it one and the same body and blood of Christ. Because of the presence and participation of the body of Christ, the Holy Supper is a meal of the most intimate fellowship and, therefore, at the same time, the highest love-meal. Just as fervent love is demanded, so fervent love is delivered. We all come together, as children of the same family, to the table of our common, heavenly Father. As great as the distinction between communicants in civic life may be, in the Holy Supper all distinctions evaporate. We are all the same, in that we each eat the same earthly and heavenly bread and drink the same earthly and heavenly drink. In this Meal, the subject and his king, the slave and his master, the beggar and the rich, the child and the old man, the wife and the husband, the simple and the learned, truly all communicants stand as the same poor sinners and beggars, hungry and thirsty for grace. Although one may appear in a rough apron while another in velvet and satin, adorned with gold and pearls, when they depart, all take with them that for which they hunger and thirst: Christ’s blood and righteousness as their beauty and glorious dress. No one receives a better food and better drink than the other. All receive the same Jesus, and with Him, the same righteousness. 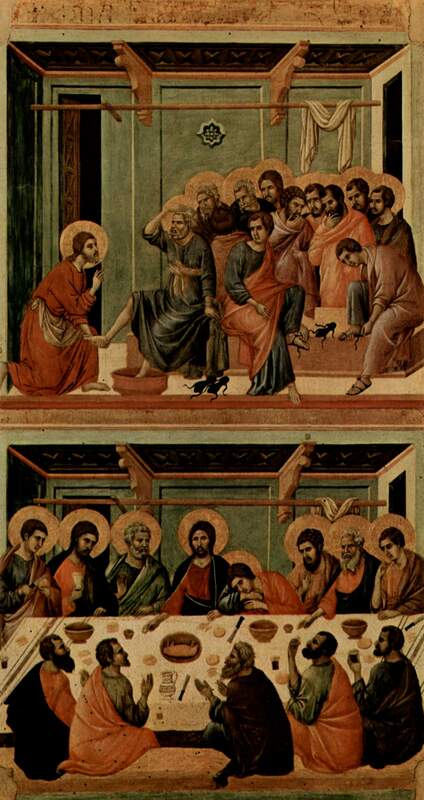 This Gospel reading for the 5th Sunday in Lent (Year B) includes the third Passion prophecy and immediately after that James and John request Jesus that they sit on His right and left hands in glory. It was as if they had not heard the prophecy of the crucifixion at all. The Apostle Paul wrote to the spiritual Corinthians, who were thinking they were standing so tall as the saved that sins involving their bodies could not affect them, they forgot crucial preaching of the Crucified by which the Holy Spirit made faith in them, 1 Corinthians 2: “ And I, when I came to you, brothers, did not come proclaiming to you the testimony of God with lofty speech or wisdom. 2 For I decided to know nothing among you except Jesus Christ and him crucified. 3 And I was with you in weakness and in fear and much trembling, 4 and my speech and my message were not in plausible words of wisdom, but in demonstration of the Spirit and of power, 5 so that your faith might not rest in the wisdom of men but in the power of God. Many denominations do not observe Holy Week or only in part. Near Holy Week,several years back a devout Baptist told me that he loves the preaching of Christ in his church but he could not figure how they could just ignore Good Friday. Many Lutherans, and other Christians skip on Good Friday and hasten to the sweet smelling lilies of Easter Sunday. Too many Lutherans and many Protestants disdain the sign of a crucifex in a sanctuary as “too Catholic”. Too many for that same reason do not make the sign of the Cross. We preach the Crucified, we are baptized into His death and resurrection, the four Gospels are all about His death and resurrection, then the Crucifixion is “too catholic”?! Yes, it is! Amen! The word, “Catholic” and its origin is Greek: “kata holos”, that is, according to the whole…the whole of salvation history, that is, “universal”: again, Amen! When I see photos or videos of or from mega-churches, there is no cross in sight, let alone a crucifix. Furthermore, there is no Altar and no Scriptural literalism, which is the foundation of His Presence, “This is My Body”, “This is My Blood” (see 1 Corinthians 11: 23-26), for the Supper on an Altar that is not there to begin with! The Scriptures are clear about the Lord’s Supper, “For as often as you eat of this bread and drink of this cup you proclaim the Lord’s death until He comes”. The Divine Service proclaims the death of Jesus for our salvation. They practice the divine absence. But all of the above pales in comparison to what is preached, literally, “what”, not “Who” is preached. Morals are preached. “Your best life now” with Jesus as a kind of positive thinking coach is the lecture. The Christian is put back on to himself, not pointed to the Lord. They preach the Christian, not the Christ. Holy Week is about proclaiming, preaching and teaching Christ. Attend the Church which proclaims Jesus as Lord, in which the Sacraments are administered according to the Gospel, and there are a people who know they are sinners saved by grace through faith in Jesus Christ and that faith is “not their doing”,and neither are their good works, see Ephesians 2: 4-10. Don’t flee the crucified and risen Lord, but flee for refuge to His infinite mercy to the Lord’s Church. Sympathy for the Devil?! Sympathy for Man! Can you guess his name? The song’s title is, “Sympathy for the Devil”. The singer is the devil. Jesus knows the devils and the demons game up close and personal. Some 4 times in this short Gospel lesson the demons are mentioned. Jesus knows the devil’s game: it’s you, even the Rolling Stones knew the devil’s game (and probably better than many a Christian! ): to steal “many a man’s soul and faith”. In the Bible study at the Mayflower I pointed out that sin is separation and a woman remarked, I never heard it put that way. Separation is also the devil’s game, to wrench us away from the Lord with temptation and sorrow and doubt. Illness likewise is like demonic possession: sickness gets us off by ourselves. Sickness is almost always a quarantine. When sick, what’s the one thing you want the most? Yes, to do everyday something. Simon Peter’s mother-in-law was burning with fever. She could not get up. Jesus takes her by the hand and lifts her up. The word in Greek can also be translated, raised, as in resurrected. She then went about her vocation as a mother and hostess. Jesus touches her. Sickness separates us from others while sin and the demonic separates us from God and then each other. The chasm between us and God is great and Jesus came out to bridge the terrible gulf and conquer the abyss of hell. And still be steadfast to proclaim to them that the kingdom of God is at hand, His hand, His nail-imprinted hand to save sinners and unbelievers as He has you and I.
Jesus was not puzzled by the devil’s game at all. Jesus came not to puzzle about the devil but knowing his game to muzzle him. Jesus has NO sympathy with the devil but for men and women possessed Jesus has perfect sympathy, “sym-patheo”. literally “to suffer with”. When the devil comes a knocking don’t answer that door but pray, Lead us not into temptation and deliver us from the evil one.. You cannot dialogue with the devil. Devil and his evil is cast out, muzzled, renounced and rejected, but even that is not enough, for by our own strength we can stop devil and evil. IF we try we are only fooling ourselves but not the evil one. Remember those questions at a Baptism are prelude to the Baptism itself, the door of Jesus Christ opening the reign of heaven to you and to me. When the devil says you are not good, you are not holy, you should have more in life, you’ve been gypped by life, just pray to the Lord and pray: But I am baptized! I am Christ’s. The Door’s been opened and the Lord has come in and you to the Lord. All of the town of Capernaum came to the door of Peter’s home at sunset and Jesus healed the sick and cast out demons. The folks in Capernaum wanted what Jesus was giving, at no cost, except the cost to Him. Here was Jesuscare: sheer grace for the burdened, free and freeing. Jesus had already begun bearing the sin of the world. He began bearing the sin of the world from His birth. It took the Lord 6 days to create the heavens and earth but it took Him 33 years to save us. As Isaiah foretold the government would be upon is shoulder fromthe get go.Behold the Lamb of God who takes away the sin of the world, preached John: taking away the sin of the world right then and there. This was to fulfill what is written in Isaiah 53: Surely he has borne our griefs and carried our sorrows. Healing, saving, loving is the essence of the Lord for His people. Poor Peter’s mother-in-law, it is sunset and the whole town is at her door and Jesus was at the door of that home turned into the Church that evening. As the Lord said, I am the door. If anyone enters by me, he will be saved and will go in and out and find pasture. The huddled masses were at the door yearning to be freed. We think sickness of the body is more terrible than sickness of the soul. He did not heal every sick person in Palestine for He came out, as He put it to preach, to preach the Gospel Word to free from the terror of the sickness of sin, bind the strong man and free man trying to save himself when he cannot. After that evening, Jesus goes to bed then gets up early, before rise of sun to pray. In a sense He retreated. He seems to have planned to this. Maybe the door at Peter’s house was also a battle line. The Lord had been fighting the enemy, the terrorists of soul and body. He was spiritually tired. His coming out into the world for the life of world was about Him and it was centered on His Father’s Word who said of Him, This is my beloved Son. This is what the Liturgy, the Divine Service is all about: It’s about the beloved Son of the Father. This is a way of looking at the Divine Service and all the services of God’s House: a retreat every Sunday morning, away from the battle line. Jesus, true man, needed to be with the Lord. He was tempted in every we are, yet was without sin, yet was bearing already your sin and mine. He needed to pray. Too many times worship services are conceived as about us. No. A retreat is not about more about me and us, but more and ever more about the Lord, more about Jesus. The Lord has given Word and Sacrament for one purpose to proclaim through them of Christ, This is my beloved Son. The one door is open and all who enter into will find a Father’s welcome and freedom from their sin. He touches us with bread and wine, His body and His blood as He Himself has done so in His House. We all need to retreat from the battle lines. And it is not Peter’s mother in law serving the Lord, but the Lord serving us: in the Name of the Father, and of the Son and of the Holy Spirit. Now the peace of God which surpasses all understanding, guards your hearts and minds in Jesus Christ our Lord. Amen. Is this righteous eating and drinking? No, sadly I think it is self-righteous eating and drinking. This is Pharisaic thinking without the excuse of religion…supposedly. Our Lord said, take and eat, take and drink. Now this night. This is the pure righteousness of Jesus Christ poured out for us and for our salvation. We come to His table as needy people, dying people, impure to purely live on His Word, every Word proceeding from His mouth, made present in bread and wine as He promised: His Body and Blood. This is pure eats. We are not the self-chosen. We need to be chosen and directed away from the world’s sin and death, and the old flesh clinging to sin. The wages of sin is death and we work for such lousy wages and He worked this night, and still does through His Word. God’s Law, which we can not keep, shows us this, that love of God and neighbor directs us away from the way of sin and death. Jesus worked Himself to death, as true man and as true God, the blood, sweat and tears of God. Mr. Falk perceptively points out that folks want to “…fulfill their instinctual need for purity and redemption…”. Though the need for purity and redemption is more than instinct, it is inscribed, the Law of God into our hearts to know Him and His will which is poured out these 3 days of the final redemption in Jesus Christ, the new and everlasting covenant. With every fiber of His being and the whole food of God dwelling in Him perfectly, for 33 years He came to this point so that your life and mine has a point: His dying and rising. He is the Bread of Life as He promised. We open our mouths, open our hearts to Him. But it is not opening our mouths and by eating and drinking alone will make us pure and redeemed. It is faith which holds and clings to Jesus Christ. This is for body and soul. The Lord made us a unity of body and soul. The Lord for our salvation demonstrates this till He comes again in power by His Presence in His Supper because bodies don’t believe and souls don’t eat (Pr. and Prof. Hermann Sasse). The bread of this world is bought and sold. We can not buy the Bread of Life, Jesus Christ, He has bought us with His blood. We can not buy eternal life in Christ, He gives it. We can not buy this blessed Communion, we are baptized for it, for Him, in Him and through Him, the Passover Lamb. The eastern Orthodox will refer to the priest as “serving the Liturgy”. This is meet, right and salutary so to speak. Jesus Christ is One Who serves and we are called by Him to do the same. Serving His body and blood and serving our neighbors in His love, following His example. When the Lord says, “This cup that poured out for you…”, the verb in Greek, translated as “poured” is actually present tense. It is hard to translate it into every day English: This cup pours out for you…It does, beloved! Or this cup pouring out for you. For you! As it poured out His veins upon the Cross, as His life, His circumcision on the 8th day, His ministry, Supper, Baptism, creation, re-creation, crucifixion, resurrection and ascension is preached and taught and pouring out for us all. The so-called pure eats of the new religion of food is only for them who can afford it. Not here. As great as the distinction between communicants in civic life may be, in the Holy Supper all distinctions evaporate. We are all the same, in that we each eat the same earthly and heavenly bread and drink the same earthly and heavenly drink. In this Meal, the subject and his king, the slave and his master, the beggar and the rich, the child and the old man, the wife and the husband, the simple and the learned, truly all communicants stand as the same poor sinners and beggars, hungry and thirsty for grace. Although one may appear in a rough apron while another in velvet and satin, adorned with gold and pearls, when they depart, all take with them that for which they hunger and thirst: Christ’s blood and righteousness as their beauty and glorious dress. No one receives a better food and better drink than the other. All receive the same Jesus, and with Him, the same righteousness (Dr. C. F. W. Walther). The Divine Service with Imposition of Ashes, 7:30pm at the Hillel House, Jewish campus ministry center, 204 W. Washington Street, Lexington, VA.
We live today in a death-denying culture. This is clearly seen in the unobtrusive appearance of the ordinary funeral home, in its attempt to look like all other houses. Inside, the “funeral director” tries to take care of things in such a way that one will not notice that one is sad; and a parlor ritual is designed to transform a funeral into a semi-pleasant experience. There is a strange conspiracy of silence con­cerning the blunt fact of death, and the corpse itself is “beautified” so as to disguise its deadness. But there existed in the past and there still exist—even within our life-affirming modern world—”death-centered” cultures, in which death is the one great all-embracing preoccupation, and life itself is conceived as being mainly preparation for death…Christianity is not reconciliation with death. It is the revelation of death, and it reveals death because if is the revelation of Life. Christ is this Life. And only if Christ is Life is death what Christianity proclaims it to be, namely the enemy to be destroyed, and not a “mystery” to be explained…A martyr is one for whom God is not another-and the last-chance- to stop the awful pain; God is his very life, and thus everything in his life comes to God, and ascends to the fullness of Love…And if to love someone means that I have my life in him, or rather that he has become the “content” of my life, to love Christ is to know and to possess Him as the Life of my life…The great joy that the disciples felt when they saw the risen Lord, that “burning of heart” (see Luke 24) that they experienced on the way to Emmaus were not because the mysteries of an “other world” were revealed to them, but because they saw the Lord. And He sent them to preach and to proclaim not the resurrection of the dead-not a doctrine of death-but repentance and remission of sins, the new life, the Kingdom. They announced what they knew, that in Christ, the new life has already begun, that He is the Life, Eternal, the Fulfillment, the Resurrection and the Joy of the world. 0 Thou sinless Son of God! From the bonds of sin forever. And with piercing thorns they crowned Thee. And with heavenly glory crown me. Me to comfort in my anguish. That my doom should be prevented. Author: Ernst C. Homburg, 1659, ab.